Xiaomi set the bar high for itself in February, when it launched its excellent Mi 5 smartphone. Between its premium build, memorable design, commendable performance and sensible pricing, the handset quickly won me over. The Chinese gadget maker is looking to top that with its latest offerings, the Mi 5s and 5s Plus. Both phones promise better cameras than their predecessor, along with elegant new designs and powerful new hardware under the hood. The all-metal 5.15-inch Mi 5s features a Full HD display and is powered by a Snapdragon 821 2.15GHz processor, paired with your choice of 3GB RAM with 64GB storage or 4GB RAM with 128GB storage. There’s a 13-megapixel camera on the back with an f/2.0 aperture. Xiaomi claims its performance is comparable to the snapper on the iPhone 6s Plus, thanks to its significantly larger 1/2.3-inch Sony CMOS sensor. The Mi 5s also features a 4-megapixel selfie camera and a 3,200mAh battery; on the front, you’ll find a seamlessly integrated fingerprint sensor, which can recognize a 3D map of your fingerprint through ultrasonic waves and therefore negates the need for a separate button on the fascia. If you’re interested in a larger device, consider the 5.7-inch Mi 5s Plus. It pairs a curved glass shell with its metal body and amps up the processor speed to 2.35GHz. You can choose between two variants: 4GB RAM with 64GB storage, and 6GB RAM with 128GB of space. Both come with a 3,800 mAh battery that supports Quick Charge 3.0. 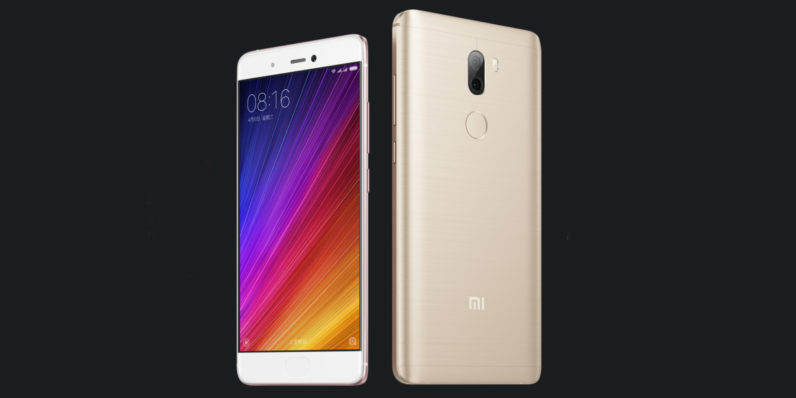 Xiaomi has graced the 5s Plus with dual 13-megapixel rear cameras, one that captures photos in black and white and the other in color. The company says this results in better image quality with less noise and sharper details. As is par for the course, Xiaomi compared the 5s Plus to Apple’s latest offering, pointing out that its new handset featured cameras that sat flush with the back panel, weighed 20g less than the iPhone 7 Plus and measured 0.2mm thinner as well. Both devices certainly look stunning in photos, and the specifications should see them go toe-to-toe with the latest top-end Android smartphones in the market today. The Mi 5s will be available in China for at ￥1999 ($300) for the(3GB+ 64GB version and ￥2299 ($345) for the 4GB+128GB version. The Mi 5s Plus comes in at ￥2299 ($344) for the 4GB+64GB variant; the 6GB+128GB variant is priced at ￥2599 ($389). They’ll go on sale on Thursday on Xiaomi’s site for customers in China, as well as on JD.com. Hopefully it won’t be long before they arrive in other countries across the globe.